I just came back from a short trip to Vancouver, Canada. For a few days, I walked around the city and ate. And drank. And then I walked some more and ate more food. There was the Korean hot pot, the Japanese blossom sushi roll, the Mediterranean spread, and the chocolate hazelnut croissant. And these are just the highlights. Back at home, the refrigerator didn’t offer much in terms of produce. But there was a package of frozen chicken breast halves, some potatoes, carrots, and a few sweet peppers. There was also a grumbling stomach and the desire to eat a few healthy, wholesome meals. 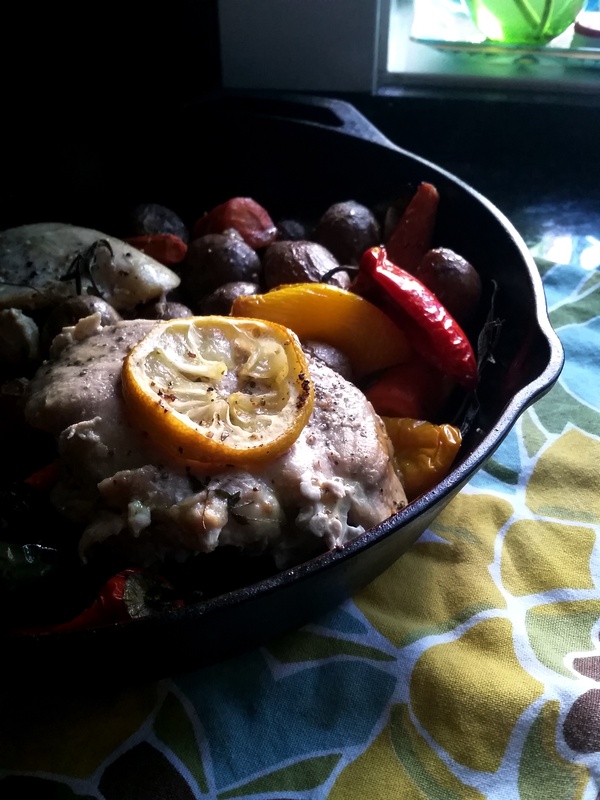 With this, I present you this super simple and super satisfying meal of One-Skillet Roasted Chicken Dinner. 1 tablespoon olive oil, plus extra for the chicken. 1. Preheat the oven to 400 F. Place a cast iron inside the skillet. 2. Combine vegetables with olive oil, salt and pepper. 3. Transfer the vegetables in a single layer to the preheated skillet. Top with chicken breasts. Drizzle with olive oil, season with salt and pepper and top with lemon slices. Tuck herbs around the chicken. 4. 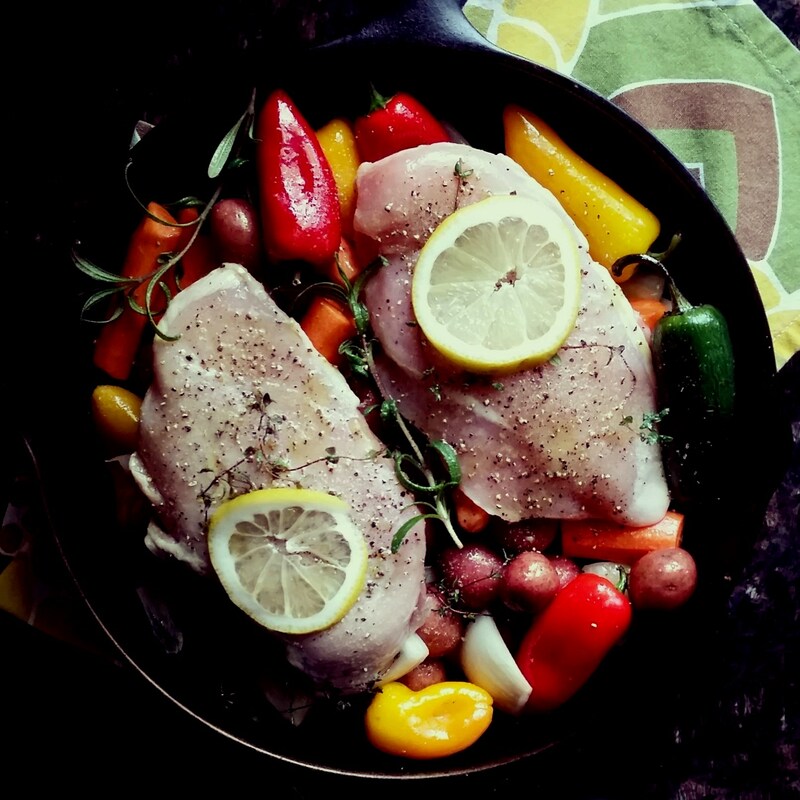 Roast in the preheated oven until the chicken registers at 165 F and the vegetables are tender, 45 to 60 minutes. And that is all. 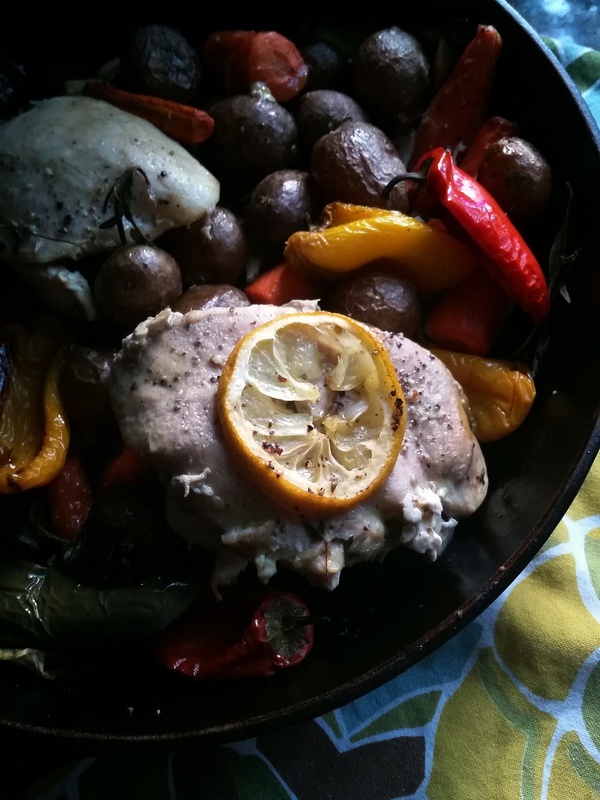 Roasted, juicy chicken with a medley of vegetables. Eat it hot as it comes out of the oven the first night. Second night? Chop it up, stir it up, and make a roasted chicken salad out of this.